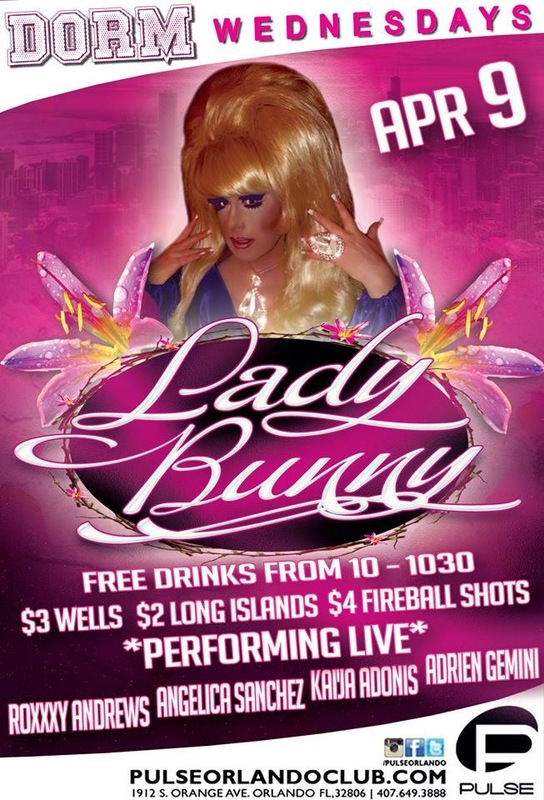 Lady Bunny Blog: THE EASTER BUNNY IS COMING EARLY THIS YEAR! Can't wait to hit Pulse in Orlando again Wednesday night for their Dorm party with Roxxxy Andrews. I know that most don't always associate the words "dorm" and "pulse" with a mature showgirl such as myself, but I'm excited about my FLA mini-tour that kicks off tomorry. Performing at George's Alibi in St Pete on Friday and spin at Miami Beach's gay pride on the beach this Sunday. Then a show at the Village Pub in Fort Lauderdale on Monday. Woohoo! I hope I run into her in St. Pete!